Jean Sibelius’ tone-poem, Finlandia, wasn’t supposed to be the program headliner one recent Saturday night at the San Francisco Symphony. The main draw was the Sibelius Violin Concerto, gracefully and sensitively rendered by Latvian violinist Baiba Skride, with Finnish guest conductor Osmö Vänskä leading the orchestra. Vänskä, music director of the Minnesota Orchestra—they of the Great Lockout of 2012-14 infamy—literally staked his position on turning said orchestra into one of the country’s finest, resigning in protest in the later months of the lockout, only to be rehired the following April (good call), where he now continues, with the Minnesota Orchestra, to excel and produce world-class music. 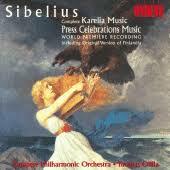 Particularly impressive are Vänskä’s Sibelius interpretations. No surprise, perhaps, as both hail from Finland and both have captured, in the music, the nuance, proud spirit and dignity of this Nordic country. 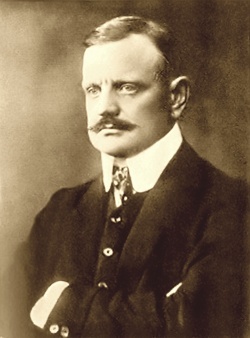 And no piece conjures a sense of Finnish national pride more so than Sibelius’ Finlandia, a patriotic tone-poem, the seventh of seven tableaux written in 1899 and revised a year later. Coming in at eight-ish minutes (can be up to nine), it’s short. The first part delivers a brooding fanfare of horns, rumbling timpani, depicting menace, oppression that, indeed, was part of Finland’s history, through occupations by Sweden and then Russia, into the early 20th century. The middle part of Finlandia calls in strings and woodwinds, a gentler but no less affecting sound, before the piece really ramps into high gear. It becomes propulsive and spirited, with plenty of crashing cymbals and an increase in speed and intensity from the entire orchestra. And now, at its peak, comes the melody, slow and majestic, instantly timeless and memorable. “So, you listened to some of the music?” the man asked. The Emily Howell composition had pleasantly surprised her, a flood of arpeggiated piano notes hovering around a melodic theme, like something Chopin or Scriabin might have composed. The Bach had been lovely and precise, like music meets mathematics. It was the Sibelius, however, that had stirred her with its rich textures and sonorities and, paradoxically, its simplicity. There were far less notes. The melody was not complex. But the horns’ mournful call, the way they sustained one of their notes against the melody, clinging, holding on, had been the most vivid aural depiction of love, fealty and longing she’d ever heard. It had made her throat contract, her eyes sting. “I preferred the Sibelius,” she told the man. Across the room, she saw Anders, smiling, engrossed in what the beautiful woman across from him was saying. Her heart gave a twist. This new thought hit her, cut into her so sharply, it made her want to cry, for a half-dozen reasons, most of them hazy and undefined, but so real, so painfully real. 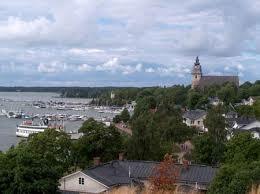 She knew, beyond a doubt, that Sibelius had reached from deep within his own heart, his soul, to produce this work. The simple melody was anything but simple. It evoked, in a mere handful of notes, the patriotic cry of a country’s freedom. December 6, 2017 marks Finland’s centennial. I can think of no better way to honor such an event than to share Finlandia with the world. Here is the English translation, although a translation never gets quite to the heart of the piece, so I’d recommend you master the Finnish language and read it that manner. Because, hey, the Finnish language looks so intuitive and translatable, doesn’t it? Kinda like Basque. Easy-peasy! beneath oppression’s yoke thou never liest. Thy morning’s come, O Finland of ours! PPS: Want to hear the original Press Celebration Music suite? In truth, it’s pretty cool, because, for you Sibelius fans such as myself, there’s some new music in there that hints at what he will produce further down the road. And there’s a pretty nifty slide show that depicts different historical scenes for each tableau, which are, themselves, intended as historical episodes. Further, you can hear the original 1899 first ending. This entry was posted in Classical Music and tagged A Scandinavian Choral March, classical music from Die Hard 2: Die Harder, Classical music in movies, Davies Symphony Hall, Emily Howell, Finland Awaken, Finland's centennial, Finlandia, Finnish national anthem, Jean Sibelius, Latvian violinist Baiba Skride, Maamme, Minnesota Orchestra, Minnesota Orchestra lockout of 2012-14, Osmö Väskä, Outside the Limelight, Patriotic tone-poem by Sibelius, Press Celebration Music suite, Russian oppression against Finland in late 1800s and early 1900s, San Francisco classical music, San Francisco Symphony, Sibelius Violin Concerto, Translation of Finlandia to English, unofficial Finish national anthem Finlandia, Words to Finlandia on November 5, 2017 by admin.